The Queensland University of Technology (QUT) has entered into a research partnership with Rheinmetall Defence Australia (RDA) that will initially focus on the University’s pioneering research into autonomous systems. Rheinmetall – which is bidding for the $5 billion Land 400 phase two contract – said it would commit $80 million in funding to finance both fundamental research into future technologies and ongoing product development. “The fund will invest in the development of a range of new technologies and products for the Australian and global markets, ensure the sustainability of the industry in Australia, while also generating advanced manufacturing jobs and enriching the Australian economy,” said RDA’s Managing Director Gary Stewart. QUT Deputy Vice-Chancellor Professor Arun Sharma said the research and development partnership with Rheinmetall would provide ‘immense’ opportunities for application of QUT’s technological innovation. “QUT has developed significant research capability in autonomous systems and robotic vision which is being recognised globally,” Professor Sharma said. In addition to striking a research partnership on autonomous systems with QUT, Rheinmetall also announced it would establish research programs with CSIRO and Swinburne University of Technology on lightweight, high-performance materials for automotive and military applications and advanced and hybrid manufacturing, and with University of South Australia on advanced sensing. 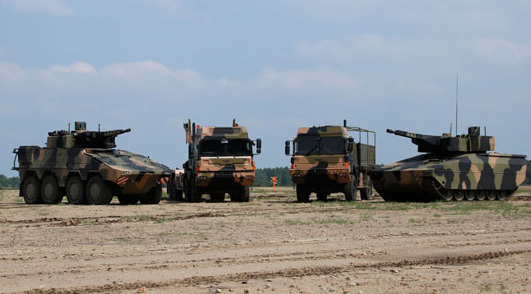 These research programs will also draw funds from the $80 million Technology and Product Development Fund which Rheinmetall will establish as part of the Australian Industry Capability program for the Commonwealth of Australia LAND 400 Phase 2 program. “The technology fund and partnerships will create a clear pathway for science, technology, engineering and mathematics graduates to enter an industry focused on military vehicles, turret systems and automotive technologies, Mr Stewart added.